"Saroj and her team were absolutely wonderful for my bridesmaids and I for my wedding. We had such a lovely, fun, relaxing and special morning. My bridesmaids looked absolutely stunning, and I couldn’t have been happier with my styling which was perfect. Saroj and her staff also were absolutely professional in styling our traditional Indian bridal wear. They accommodated for our every requirement. 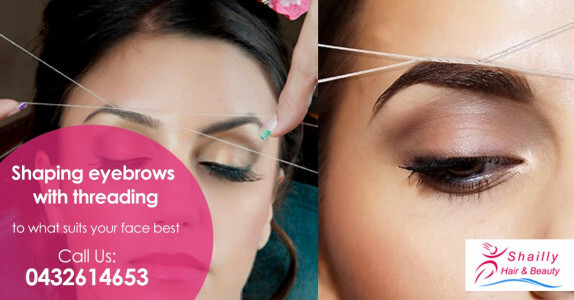 For a stress free and special wedding day, Shailly Hair & Beauty is the perfect start!" "I happen to pop in this morning on the off chance this establishment could accomodate someone with no appointment on a Saturday morning. All of the staff were wonderful and professional. I was made to feel very comfortable and it seemed nothing was too much to ask for. All of the staff called my by my name which I noticed with their other clients and just the general atmosphere was relaxed. I have surely entered another world which I couldn't stop talking about when I got home. I made my next appointment before I left and my friend is keen to come back with me. Brisbane salons could learn a lot from this business owner and her team as they all excel in customer service. Well done ladies, I am definitely going to be a regular at your salon. Much thanks as I feel totally fabulous with all the pampering I received today"
"Saroj and her team are fantastic. They provide excellent services in a lovely salon. I have had 3 sessions of IPL on my lower leg with amazing results after 1 treatment! I am looking forward to getting more treatments in the future!" "This is one of the Friendliest most accommodating Beauty Salons around, Saroj is very professional and her staff are really friendly. they make you feel very comfortable . The treatments work, i had Intraceuticals oxygen facial, I highly recommend this treatment to anyone, The salon is clean and Tidy." From the moment u enter Shailly Hair and Beauty, you are just transcended into heaven. Not only does the interior impress you with its amazing decor and fixtures but the customer service then takes you to another level. The facials are amazing with results being noticed straight after...and for the penny thrifty people...u are sure to find one that suits your budget. I usually go for waxing and threading but what really really impressed me was the IPL lazer hair reduction treatment. Firstly I am quote hairy and my regrowth was thick and black as and I had to wax atleast twice a week. Then I did the 5 IPL treatments on my chin and lip and I haven't waxed my chin in now 6 months and there is no thick regrowth. I thread my lip now maybe once a fortnight. I was totally blown away.with the results and it is not painful..just feel tingles. SAROJ and her team are very professional and friendly. I would definately recommend Shailly Hair and beauty to everyone...my daughter is also a regular there. So if u looking for superior service in a very clean environment then u definately need to go there. And if u habe hair issues like I did I very strongly recommend the IPL treatment. Your service is outstanding and exceptional Saroj, you always ensure that your client leaves your clinic feeling like "a Goddess"! You have a grat selection of quality products and prices are reasonable. You cater for all skin types and most of all you are friendly and professional and always willing to accommodate a client who turns up even without an appointment at the end of a busy day!! I always get wonderful results. I have visited many salons over the years but I have finally found someone that I feel comfortable with and always ensure that I am getting the best treatment that I require for my skin type. I always leave your salon with great looking skin and feeling confident and relaxed. I will always recommended many friends and colleagues and will continue to do sa.